The Parish Council can decide whether or not to grant an easement and may agree specific actions take place as part of granting this, such as making improvements to the area. 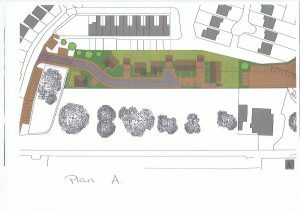 The owner’s preferred option is across the land which is currently covered with gravel and is beyond the Paving Factory, nearer to the houses on Basic Cottages, as shown on the plan. The owner has suggested that some improvements would be made to the area as part of the agreement, as can be seen on the plan. Planning approval was granted in the past for houses on the field to the front of Basic Cottages. Please note that the Parish Council has to be consulted on planning applications, but the County Council makes decisions on them. Councillors want to understand the views of those who may be affected before they make a decision, and are therefore requesting you complete and submit this very short survey – https://www.surveymonkey.co.uk/r/QLHHBCY – on or before Thursday 25th April 2019.